Aggressive Behavior is widely read by anthropologists, behaviorial scientists, ethologists, neuroendocrinologists, psychiatrists, psychobiologists, psychologists, sociologists, zoologists, and all members of the International Society for Research on Aggression. Your article will be posted online as soon as it is ready, before the release of the compiled print issue. Aggressive Behavior offers online manuscript submission and peer-review via Manuscript CentralTM, a user-friendly system making manuscript submission and tracking quick, easy, and safe. Aggressive Behavior is available online through Wiley Online Library®, Wiley’s Internet publishing platform. Wiley Online Library® has more than 29 million user sessions per year. Publishing at Wiley is truly a collaborative process. We value the long-term relationships we have with our authors and we are committed to maintaining the standard of excellence that has been essential to Wiley's success for nearly two centuries. A full description of author guidelines may be found here. Aggressive Behavior will consider manuscripts in the English language concerning the underlying causes or consequences of aggressive and violent behavior. 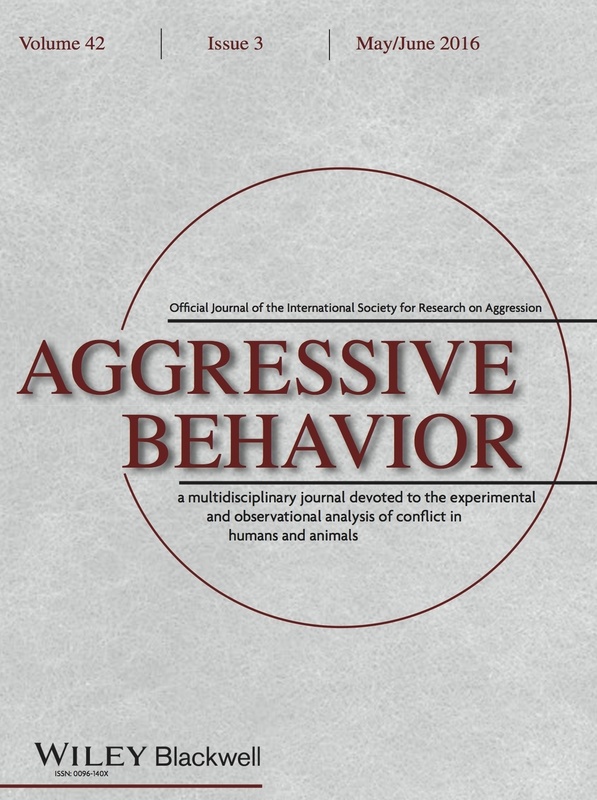 Both behavioral and neuro-physiological studies concerning the underpinnings of human and animal aggression will be considered, and articles that integrate the two approaches are particularly encouraged. The journal focuses on empirical studies, but broad theoretical reviews are also encouraged. All published articles will appear in both the printed version and web version of the journal. Every manuscript and revision must be submitted electronically through the ScholarOne Manuscripts (formerly known as Manuscript Central) website for Aggressive Behavior at mc.manuscriptcentral.com/ab. Please follow the instructions on the website carefully. You will need to register as an author the first time you use it, but, after that, the process will be quicker. The manuscript itself is submitted as a Word file through the website. Manuscripts are not blind reviewed, and authors need not remove identifying information from the text. Full research papers should be as concise as possible, without sacrificing documentation of the results, and be limited to 30 pages including the title page, abstract, text, references, tables and figures. In exceptional circumstance, e.g., multi-study papers or meta-analyses, a longer limit will be considered. In such cases this should be noted in the accompanying letter. If authors are concerned about fitting their work into these guidelines, they should look primarily at the Introduction and Discussion sections. Manuscripts must be word processed, double spaced using a standard 12-point font, such as Times New Roman or Ariel, and must follow APA Style (Publication Manual, 6th edition, see www.apastyle.org). Spelling should follow Webster's Dictionary (American). For studies on humans, a clear statement must be provided concerning informed consent, and that experimental studies of humans require that the protocol has received prior approval by the appropriate body and that informed consent was obtained from each subject. Animal experimentation must also receive institutional approval and be conducted in accordance with the United States Public Health Service's Policy on Humane Care and Use of Laboratory Animals. Submissions must include evidence that the human and animal research complies with the standards in force in the country of origin. When a paper has a “revise and resubmit” decision, we would normally expect authors to resubmit it within three months from the date of the decision letter. If the author has a good reason for taking longer, an extension can be granted by the Associate Editor dealing with that paper.